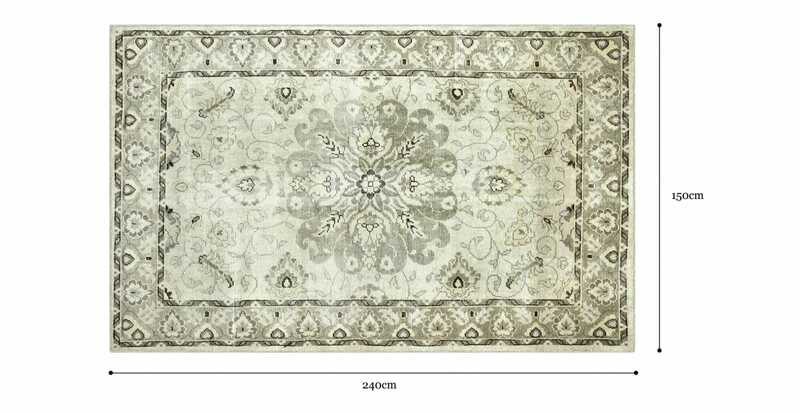 With its intricate design, the Saser Small Wool Rug is the epitome of elegance underfoot. Handmade in India, the pretty Persian piece comes in three shades and has a faded antique look. Discover more rugs from Brosa. Want to spend less time cleaning? The Saser is made from 100% wool, which is a natural fibre that loves to resist moisture and stains. Perfect for humid or home environments. Up to 12 months of dedicated craftsmanship has gone into the creation of the Saser Rug. Made using an intricate hand knotting process, the result is a rug that is low shed and will last you over 20 years. Don't be afraid to show off your Saser Rug, which easily brushes out foot prints and hides dirt. The thick pile of the carpet makes it suitable for bedrooms, dining rooms or living areas.